Looking for something a little arty to compliment a sea-themed sushi platter? Majestic and beautiful, this Cucumber Whale Garnish is every bit the ideal center-piece. 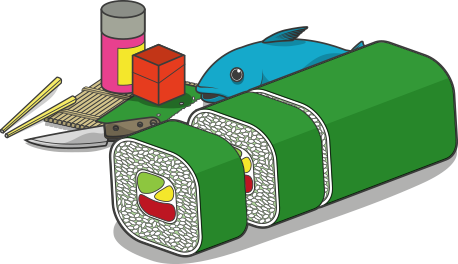 Created with a few precision cuts and a little freehand tracing, this tutorial is suitable for both beginner, and intermediate sushi maestros! With, or without their skins, cucumbers are an intrinsically bitter vegetable. The Japanese refer to this bitterness as “aku”, and, while some savor this unique flavor, it isn’t always ideal paired with the delicate rice and fish used in sushi. There is a very simple way of drawing out the sweetness of cucumber – with salt. Begin by rubbing the entire cucumber skin with salt, ensuring a light coating all over. Leave the rubbed cucumber to rest for approximately 2-3 minutes, allowing time for the enzymes in the cucumber skin to react to the salt. Wash the cucumber thoroughly under running water, ensuring no salt remains. Then, gently rub dry with a paper towel. Hold the paring knife between thumb and forefinger, as close to the tip of the blade as is practical. To trace the underbelly of the whale, first make a horizontal incision approximately 1/2 cm (1/5 of an inch) deep, starting from the tip of the cucumber. As the knife glides through the flesh, angle the tip of the knife downwards to create the outline of the first pectoral fin. Make a similar, symmetrical cut on the opposite side of the cucumber. To create the 2-tone contrast of the Killer Whale, you will need to remove a partial amount of cucumber skin on one side of the cucumber (within the trace cuts). With a sharp paring knife, simply glide the tip of the blade under the skin of the cucumber, starting at the top. Use your thumb as a guide, helping the blade to slide through the flesh. You will need to peel away all of the skin one one side, within the area of the trace cuts. The peeled area of cucumber should arc downward at a 45-degree angle on either side of the cucumber. It is at the bottom of each ‘slope’ you need to make a curved incision to trace the pectoral fins. Next, align the tip of the blade flat at the top of each fin and gently slice into the skin, leaving the fin attached. These can then be teased out with the tip of the knife. Lift up the pectoral fin on one side, and lay the cucumber flat on the chopping board. With your knife, make a new 45-degree incision as close to the fin as possible, without cutting into it. Repeat on the other side, then slice through until the rest of the cucumber is separated. Stand the whale on its (cut) end to ensure it stays upright. To create the ‘eye spots’, turn the cucumber over so that the pectoral fin on one side is facing you. With the tip of the knife, make two, equal, curved incisions a centimeter forward of the fin. Again, these should be approximately half a centimeter (1/5 of an inch) in depth. Repeat on the other side. Then, angling the blade horizontally, gently slice off the surface skin. For the dorsal fin, make a single incision on the back of the whale, approximately 2-3 centimeters in length. Take the piece of cucumber set aside earlier, and with the knife angled horizontally, gently slice off a small triangle of skin. Slot this into place on the back of the whale to create the dorsal fin. Trim the ends and excess off the other half of the cucumber. Holding it in one hand, begin tracing the outline of the whale’s tail, keeping the design as symmetrical as possible. This is best achieved by working across the width of the cucumber – first making a ‘v’ at the center. Once you have traced the outline of the tail, make two very shallow cuts at the tips of the whale’s tail on either side. With the tip of the knife, lift up both sides of the tail. To separate the tail section, make a clean ‘v’ cut a few millimeters behind the design. Once removed, cut away the excess cucumber, following the outline of the design. Finally, slice a small, horizontal section from the base of the tail, so that it stands upright. Storage and serving: The cucumber whale may be kept in a container of water and refrigerated for up to 24 hours. This will also cause the tips of the tail and dorsal fin to curl, adding to the visual effect. Serve as a central garnish on a flat board or plate, complimented by a little fresh Wasabi and pickled ginger.